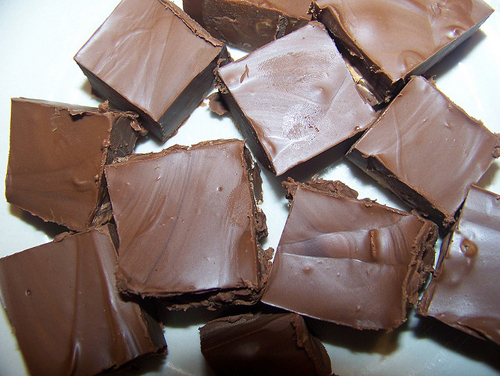 Happy National Fudge Day! There are so many great fudge varieties and recipes out there, but we have gone with something classic for this week’s recipe: chocolate peanut butter fudge. Make this sweet treat to keep in your kitchen for an afternoon pick-me-up, or bring along to a summer party and enjoy! Line the 9×9 inch pan with parchment paper. Combine the sugar, evaporated milk, and cocoa in the saucepan. Stir occasionally over low-medium heat until mixture comes to a rolling boil. Lower heat and continue cooking to a soft ball stage, about 8 minutes. Remove from heat, add peanut butter, margarine, and vanilla. Beat by hand until creamy, then pour into prepared pan. Place in the refrigerator and allow to fully cool. Cut into squares and serve! This entry was posted on Tuesday, June 16th, 2015 at 8:00 am	and is filed under Desserts, Kid Friendly Fun, Recipes, Tasteful Tuesday. You can follow any responses to this entry through the RSS 2.0 feed. You can leave a response, or trackback from your own site.